Fresh from the Garden Gazpacho! Tomatoes, cukes, and peppers are ripening – t’is the season for gazpacho . . . and Long Wind Farm was having a sale on tomatoes! There are lots of different recipes; some like it silky smooth, others like it chunky – I like to add side bowls of chopped tomatoes, cucumbers, peppers, and chives to this recipe so we can have it both ways! Chill for a couple of hours before serving. Serve on top of the gazpacho. Enjoy! 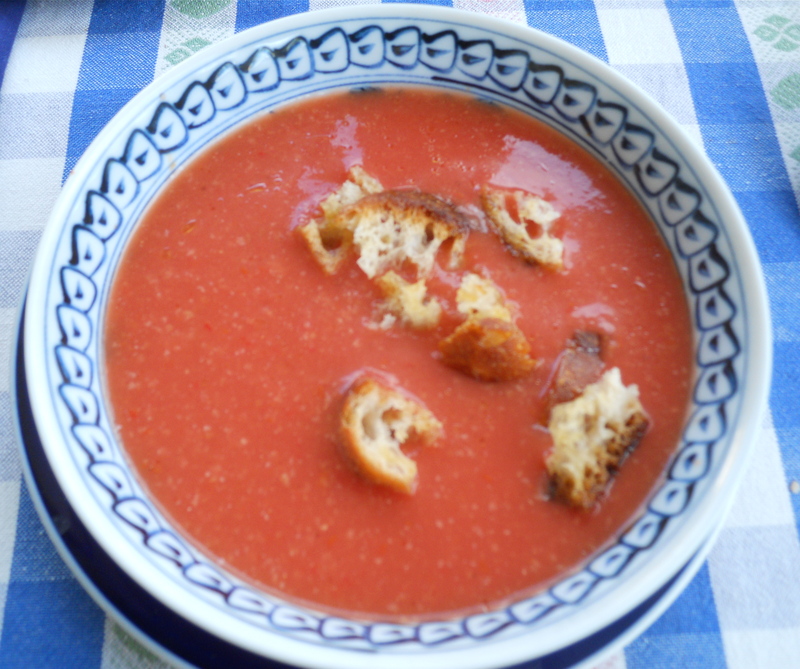 Tip: Gazpacho can be made with frozen tomatoes. If you want gazpacho next 4th of July, freeze tomatoes now! This entry was posted in garden, recipe and tagged cucumbers, peppers, tomatoes. Bookmark the permalink.